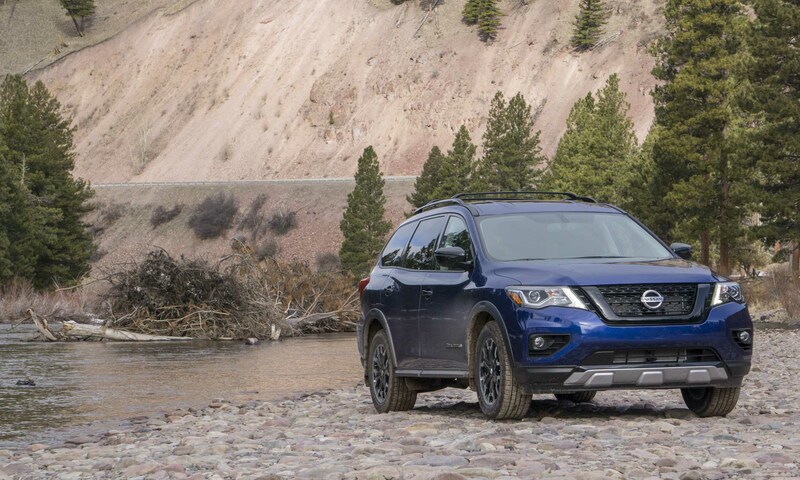 A few months ago, Nissan took the wraps off a special version of the Pathfinder to create a fresh look for a crossover that hasn’t changed much in the last few years. 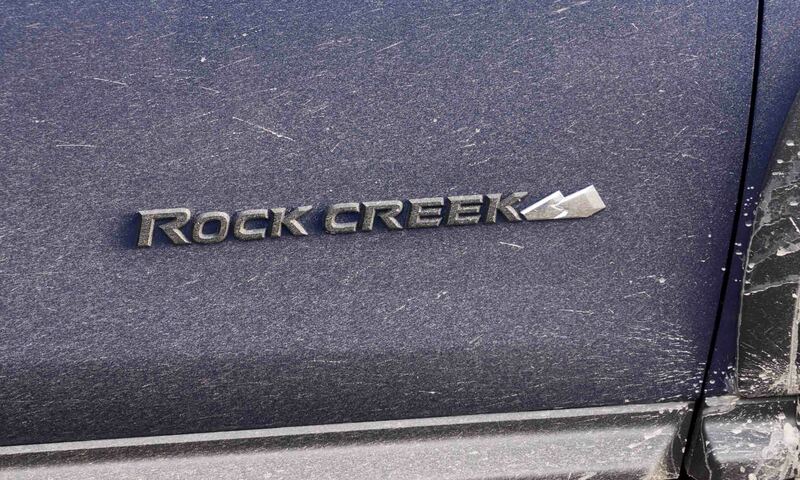 The Rock Creek Edition gives Pathfinder a singular style as well as some high-value features. 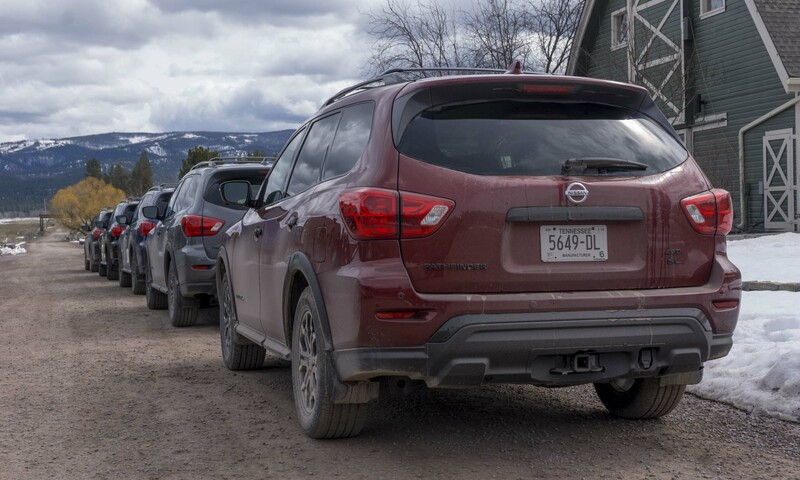 Recently Nissan invited a few auto writers to the Paws Up resort near Missoula, Montana, to experience the Pathfinder Rock Creek Edition in fitting surroundings for this type of new vehicle. 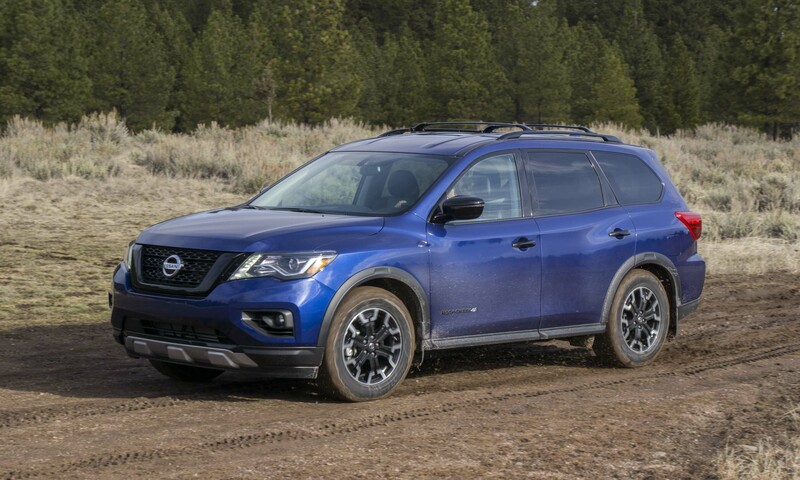 “The Rock Creek Edition name was chosen to connect to Pathfinder’s family outdoor adventure-minded target customers,” said Scott Shirley, vice president of marketing operations at Nissan North America. 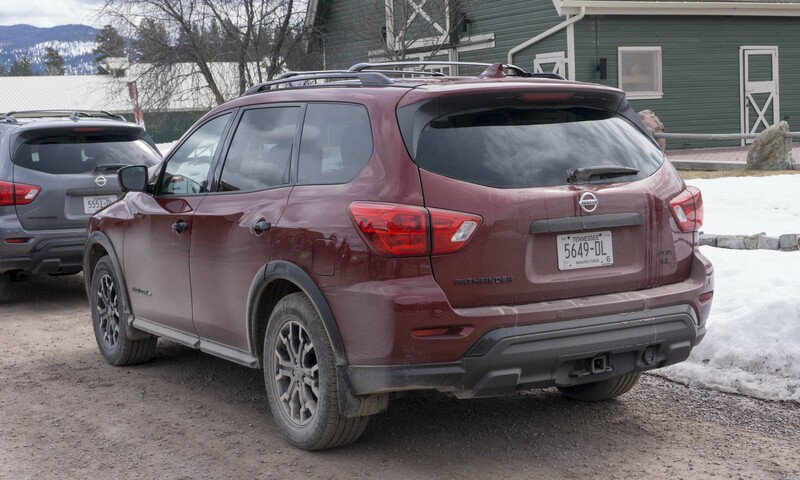 “By offering the Rock Creek Package on a range of grades, drivetrains and colors, buyers are able to customize their Pathfinders to their precise tastes,” Shirley observed. 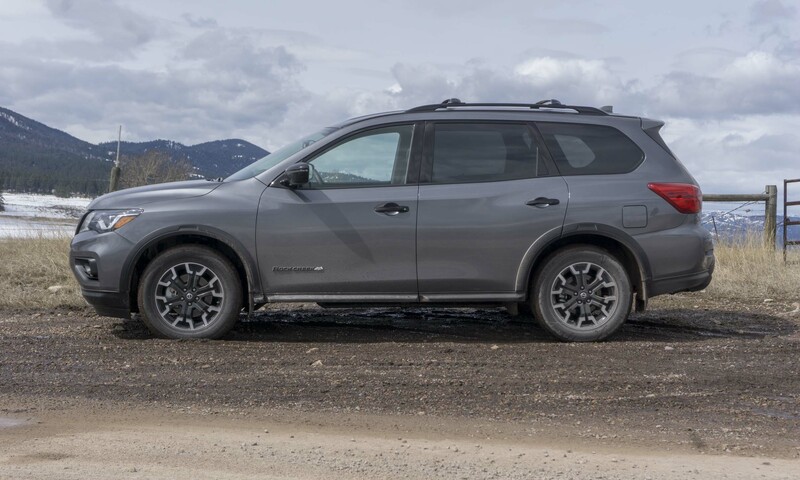 The Rock Creek Edition is primarily a decor package with little change to the functionality of the Pathfinder — it is not a specially-equipped off-road version of the crossover. 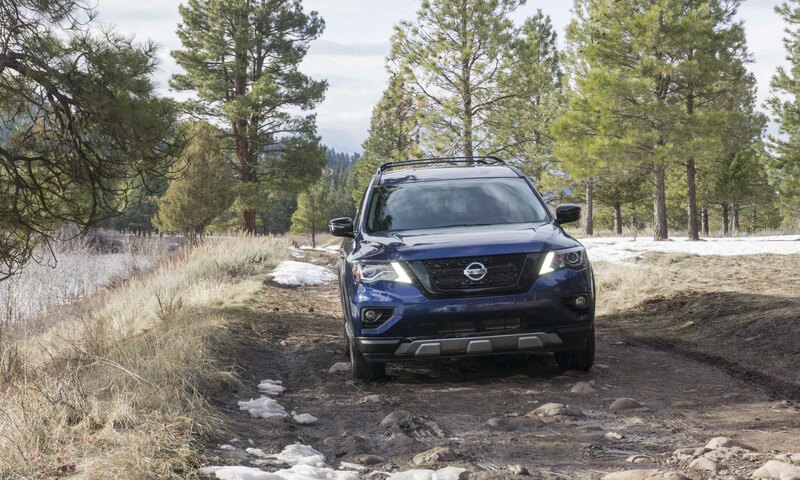 That said, the Pathfinder is still quite capable when the pavement ends — a scenario common in Montana — hence our picturesque destination. 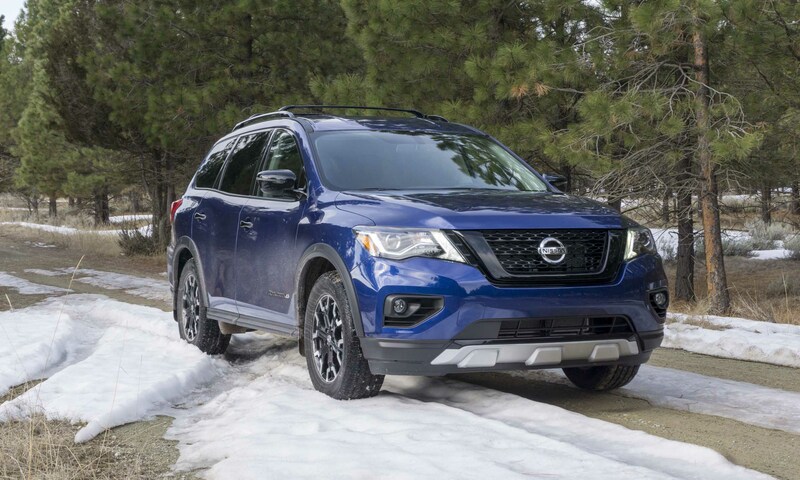 Intended as an up-level attention-getter on the showroom floor, the Rock Creek Edition is available on the Pathfinder SV or SL trims and definitely gives the big crossover a striking look. 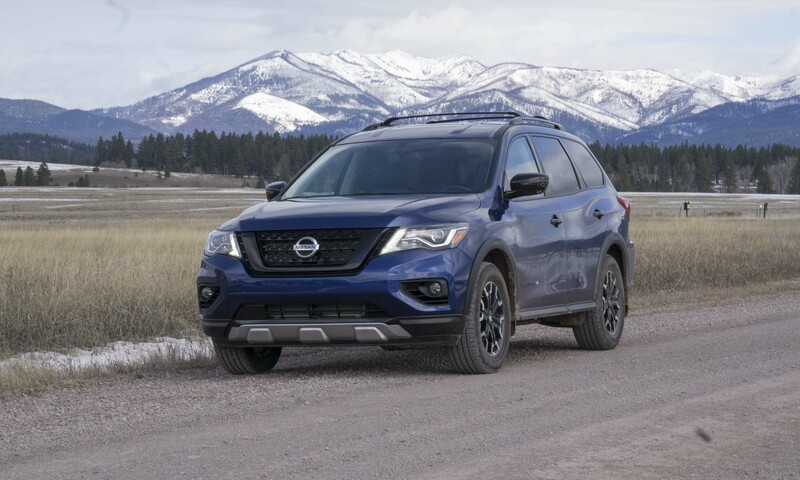 Priced at $995, the Rock Creek package includes a black mesh grille, black roof rails, black door handles and outside rearview mirrors, black front and rear fascia accents and black molded overfenders. 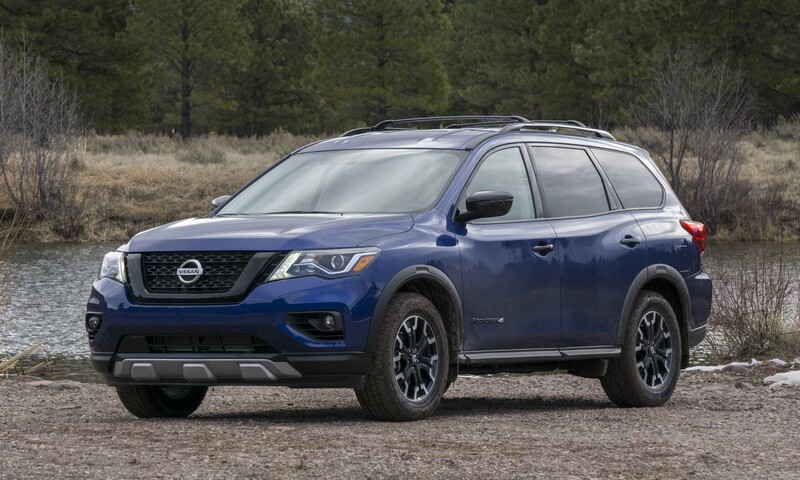 All badging is in black except for Nissan badges on the front and back of the vehicle. 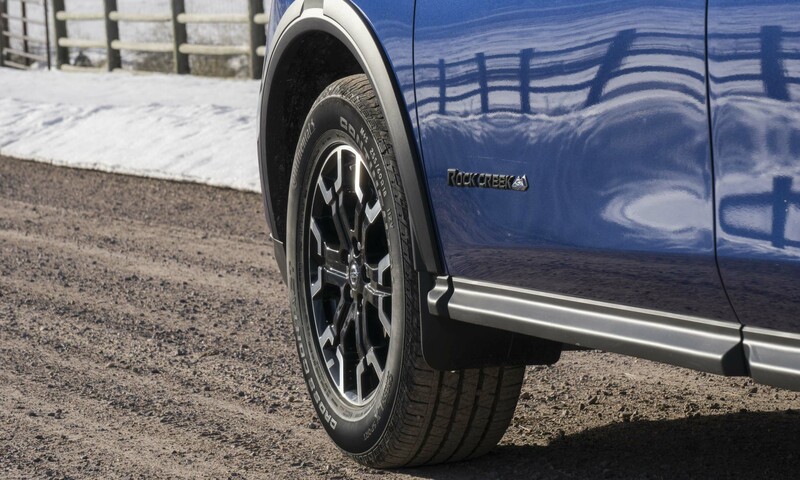 All Rock Creek Pathfinders are fitted with dark 18-inch alloy wheels styled after those found on Nissan’s full-size Titan pickup truck. 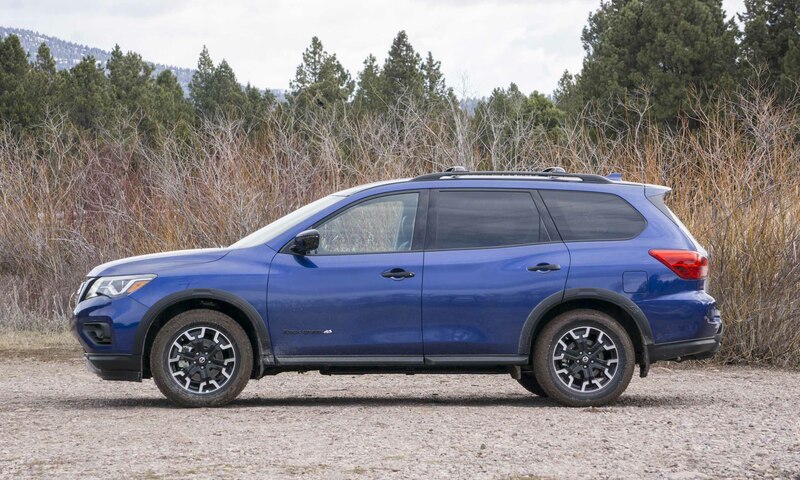 Wheels are shod with 255/60 R18 all-season tires — slightly wider than the standard Pathfinder offering. 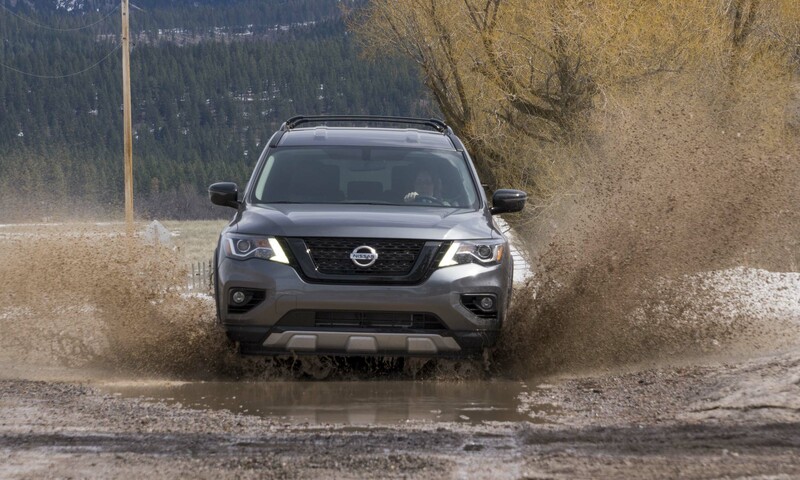 The vehicles we tested in Montana were equipped with Continental Cross Contact tires, which offer plenty of grip in dirt, mud, and snow. 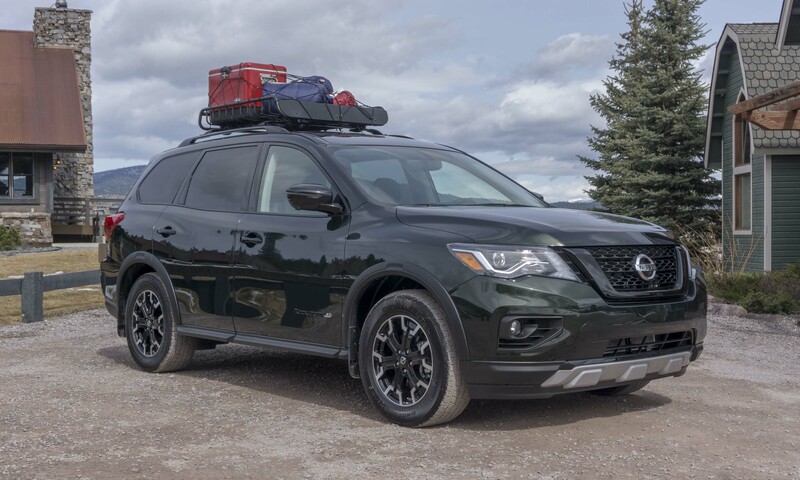 The Pathfinder’s towing package is also standard on Rock Creek Editions, featuring a tow hitch receiver with a 7-pin wiring harness and splash guards. 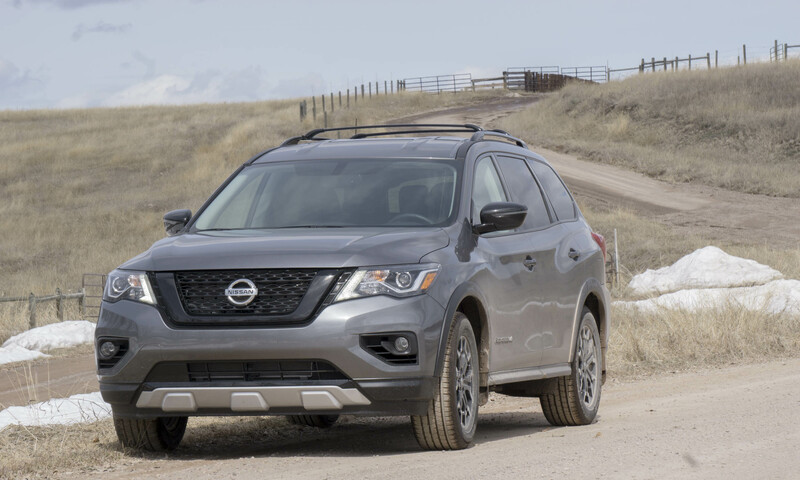 Pathfinder has a towing capacity of 6,000 pounds — higher than most midsize crossovers on the market. 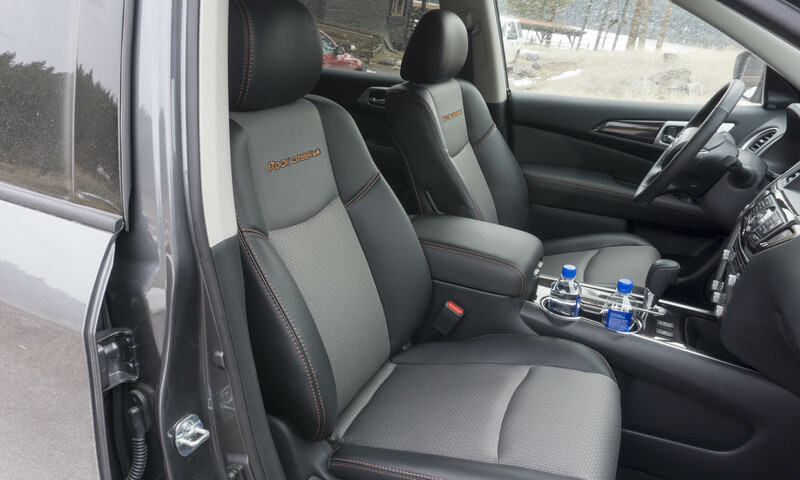 The Rock Creek Edition interior gets special treatment as well: two-tone seating surfaces; Rock Creek badging; and high-contrast stitching on seats, doors, console lid and steering wheel. 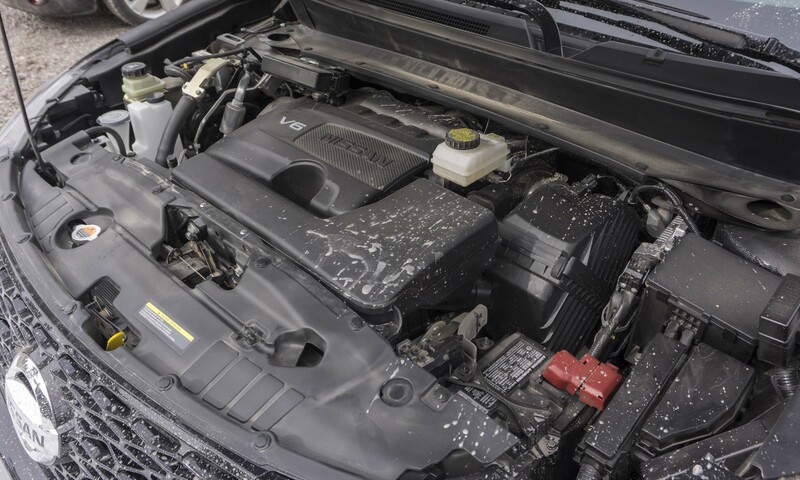 Nissan folks said the price of all features in the Rock Creek package are worth about $2,300, so the stylish design updates can be considered a good value. 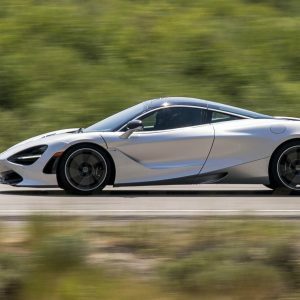 Two additional packages are available on the Rock Creek Edition. 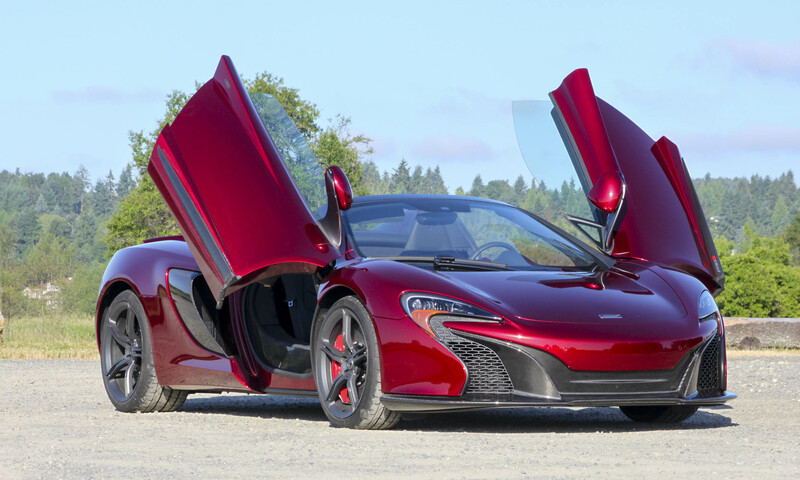 A Technology Package for the SV trim includes heated front seats, a heated steering wheel and heated outside mirrors, as well as NissanConnect Services with navigation and traffic information. 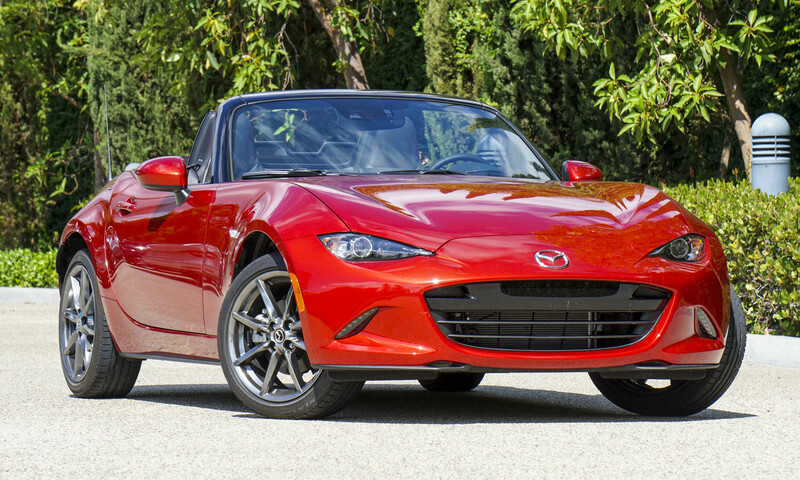 A Premium Package for the SL trim of the Rock Creek Edition adds a power panorama roof and a 13-speaker Bose audio system. 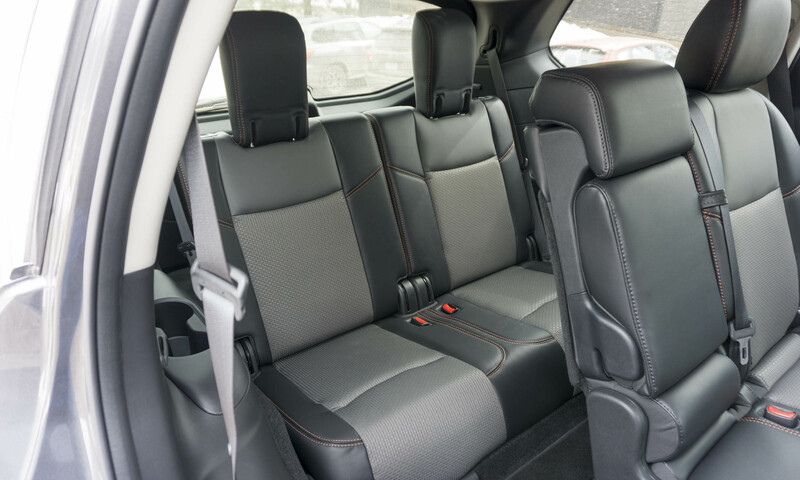 With seating for seven, the Pathfinder’s second row offers ample space for three passengers. 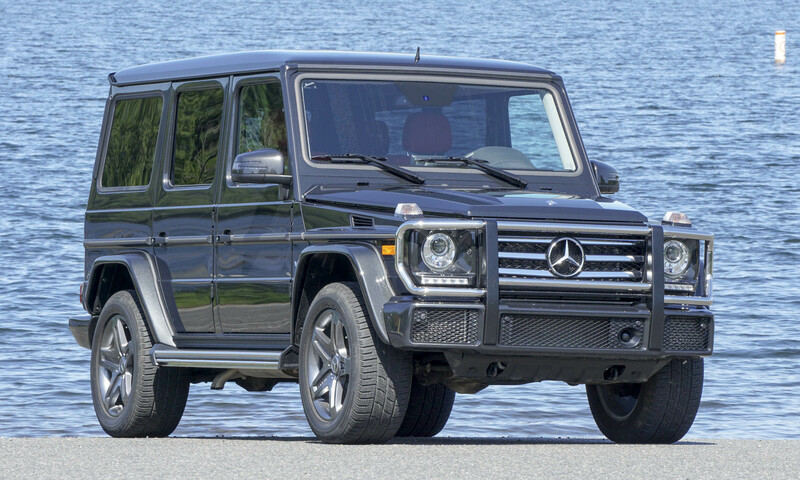 The second row can also be folded for improved cargo space, folded and slid forward for easy access to the third row, or simply adjusted fore or aft to provide additional legroom. 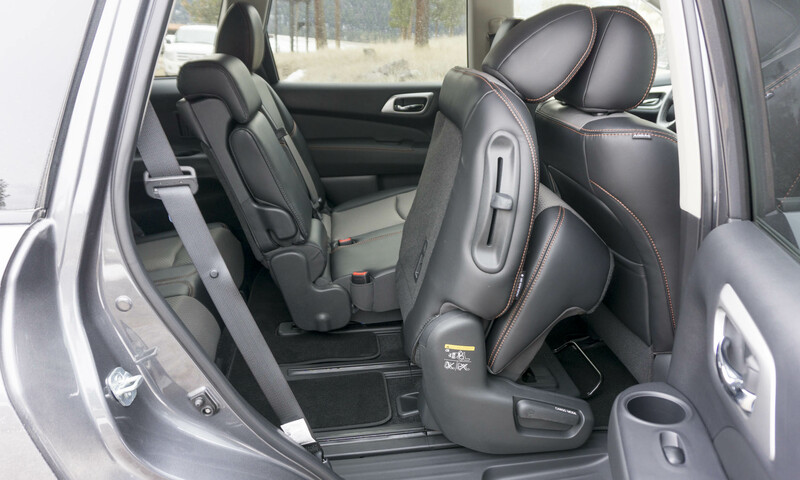 Despite second-row adjustability, the third row is very tight for adults, even with the second row slid forward. The high floor and limited legroom make it uncomfortable for taller folks, even on short trips. However, kids will not find this as much of an issue. 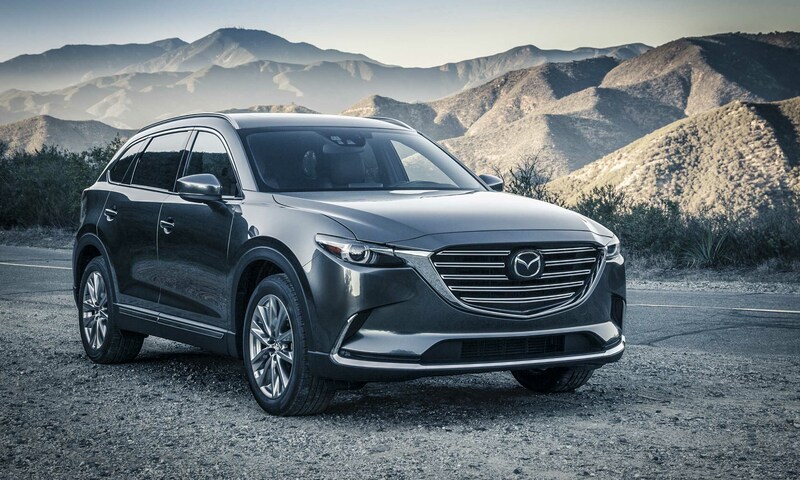 Cargo space is usable but limited when the third row is occupied, but if those aft seats are unneeded for passengers, the row folds flat to create a rather large cargo space. 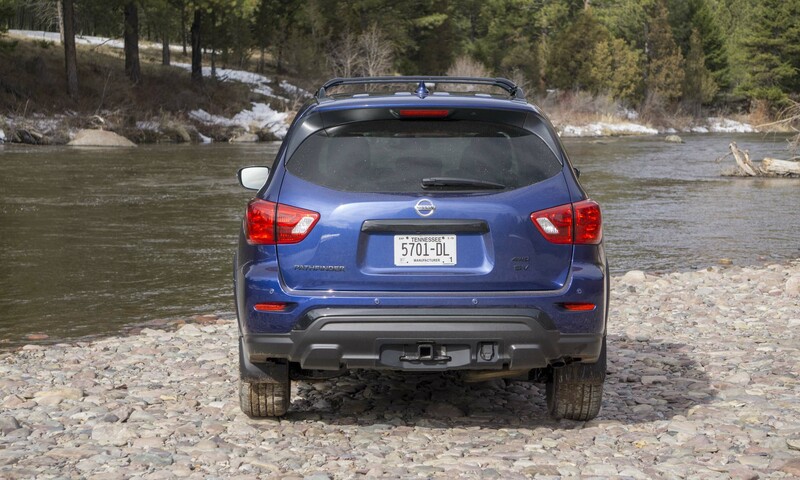 All Pathfinders are powered by a 3.5-liter V6 engine producing 284 horsepower and 259 lb-ft of torque. 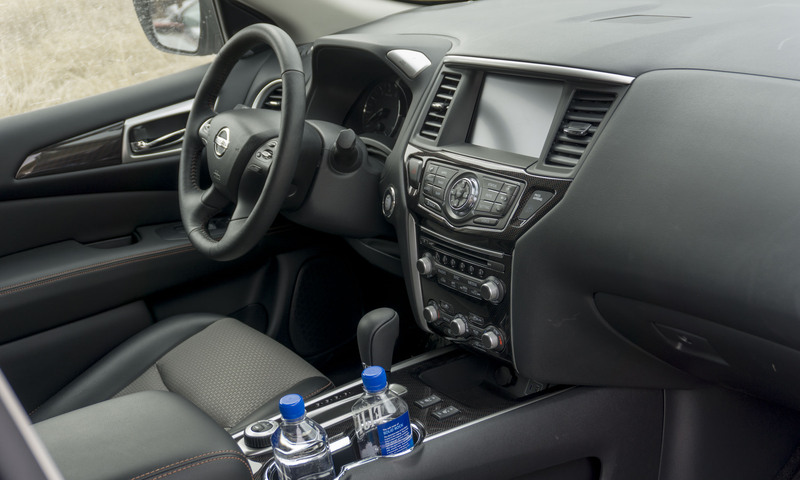 Power gets sent to either the front or all four wheels via Nissan’s Xtronic continuously variable transmission. 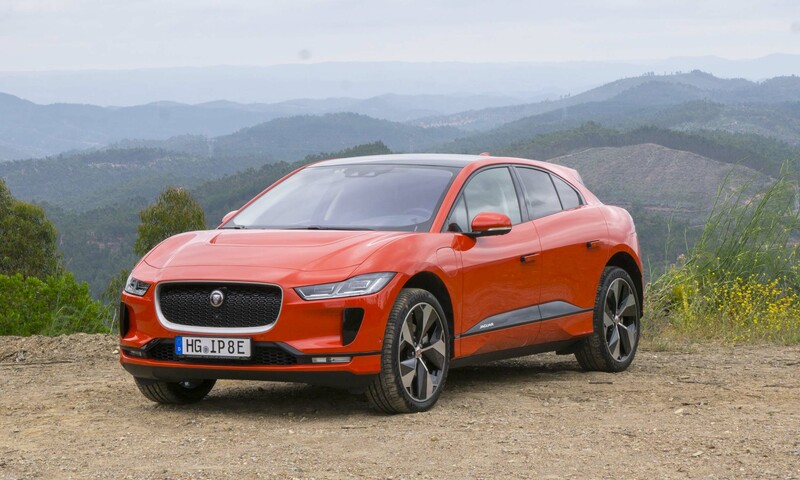 Fuel economy numbers are quite reasonable considering the vehicle’s size; EPA ratings are 19 city / 26 hwy / 22 combined for the 4WD. Site of our introduction to the Rock Creek Edition, the Paws Up resort near Missoula, Montana, is a luxury destination situated on a 37,000-acre working Montana ranch, complete with elk, bison and plenty of other wildlife. 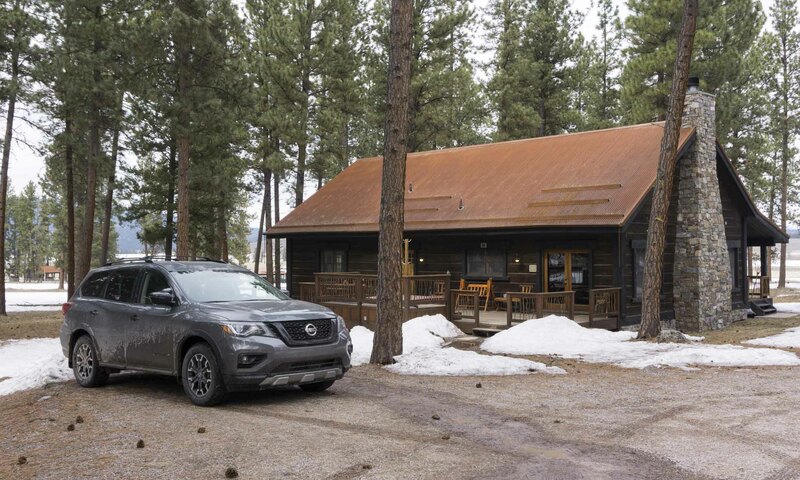 Ideal for families (or gaggles of auto writers), Paws Up offers more than 40 outdoor activities with outstanding service and excellent dining. 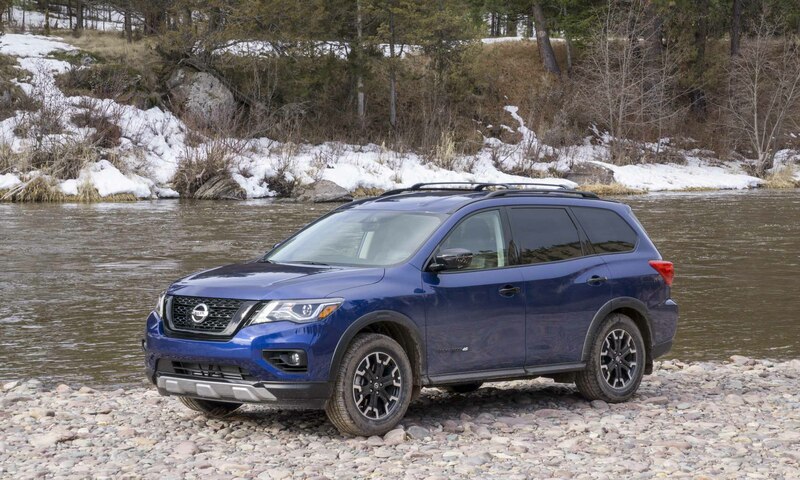 As intended by Nissan’s marketing pros, the Rock Creek Edition Pathfinder fit seamlessly with the incredible surroundings. 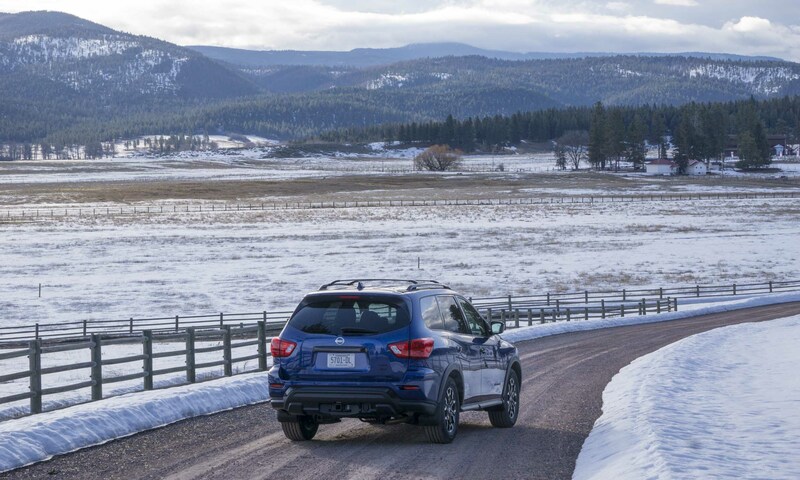 During our brief sojourn in Montana, conditions on most roads in and around Paws Up were dirt or mud with remnants of snow. 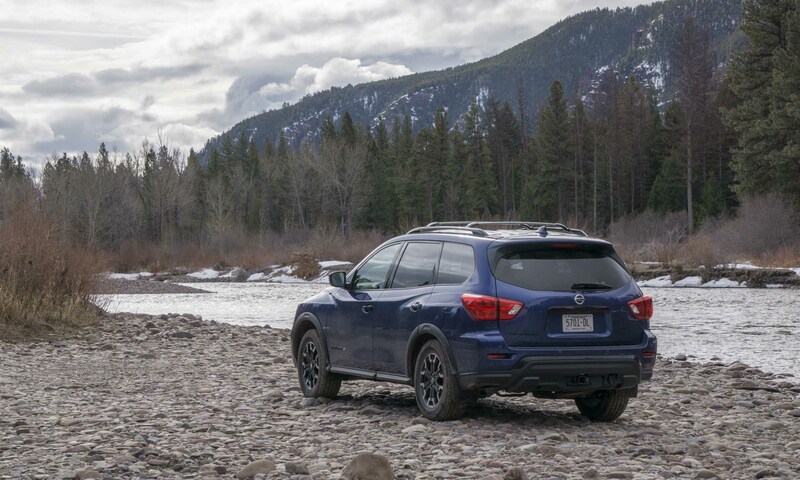 Although the Pathfinder Rock Creek Edition is not intended for extreme off-roading, it functions quite well for exploring this beautiful part of the country. 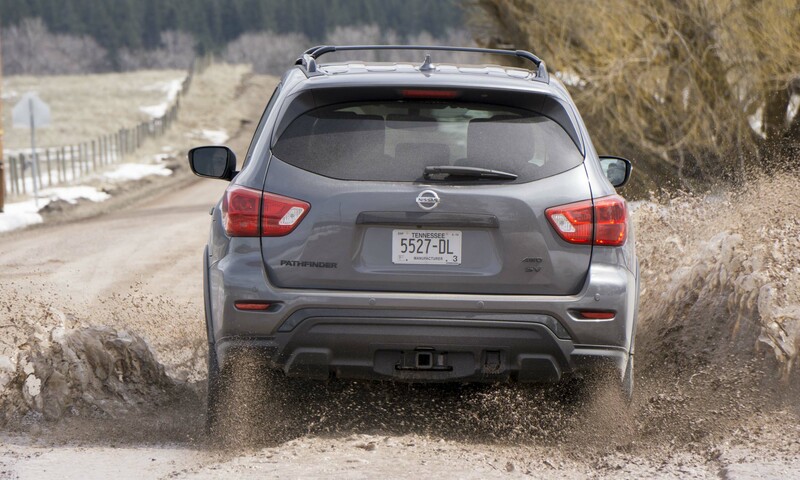 The upgraded all-season tires provide plenty of grip, and 4-wheel drive — which engages on the fly with the turn of a dial — kept us moving when we ran into a patch of rather sticky mud. 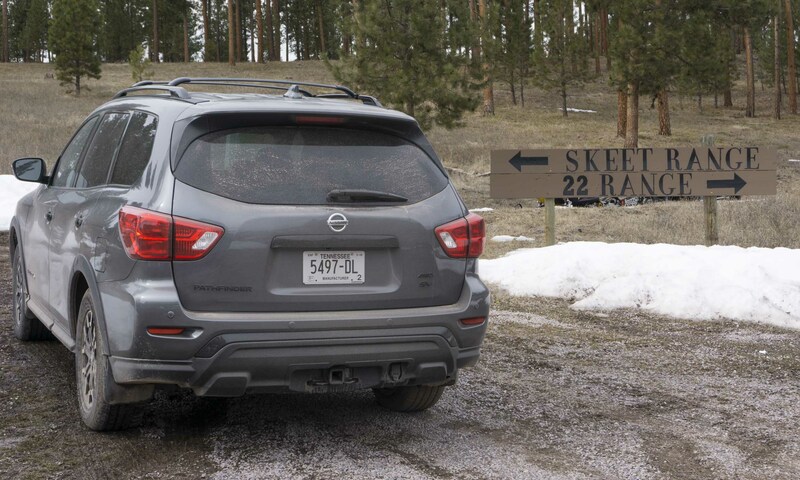 The Pathfinder turned out to be a great vehicle for exploring the Paws Up acreage. 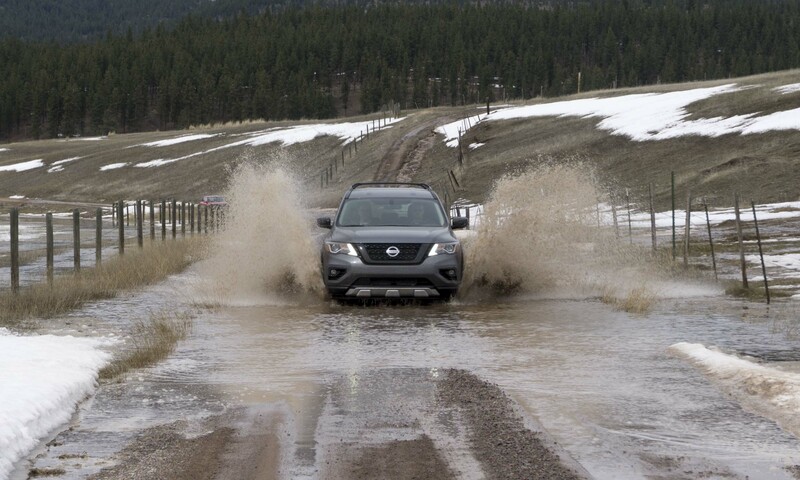 Warming spring weather created a lot of melting snow, which meant the road varied from hard dirt to loose gravel to being underwater. 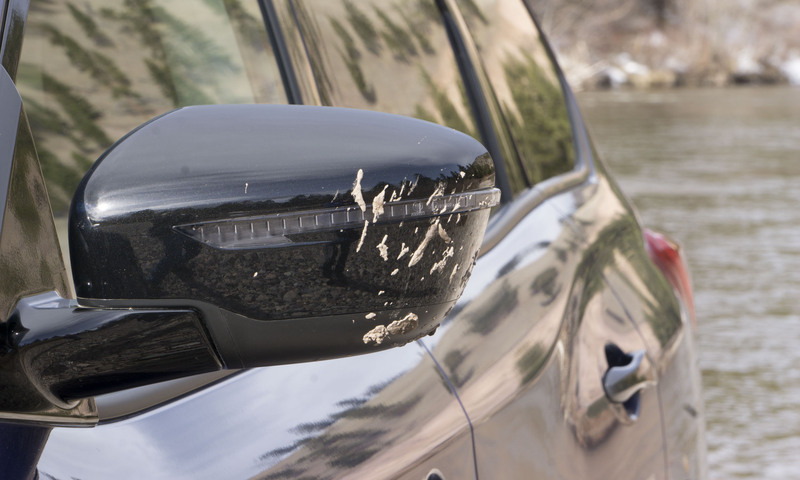 The big SUV felt surefooted even at higher speeds, allowing us to enjoy the drive as well as the spectacular sights. 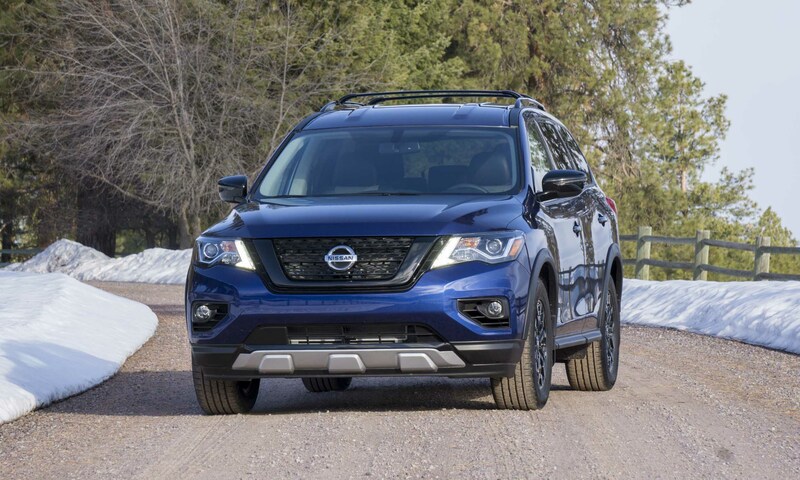 Even though Pathfinder is quite capable where the pavement ends, most will operate it as a family vehicle that never leaves civilized surfaces. 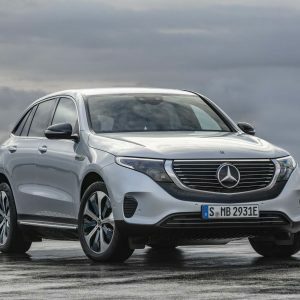 We found the big SUV has more than adequate power for strong acceleration, and the CVT is one of the better ones on the market. 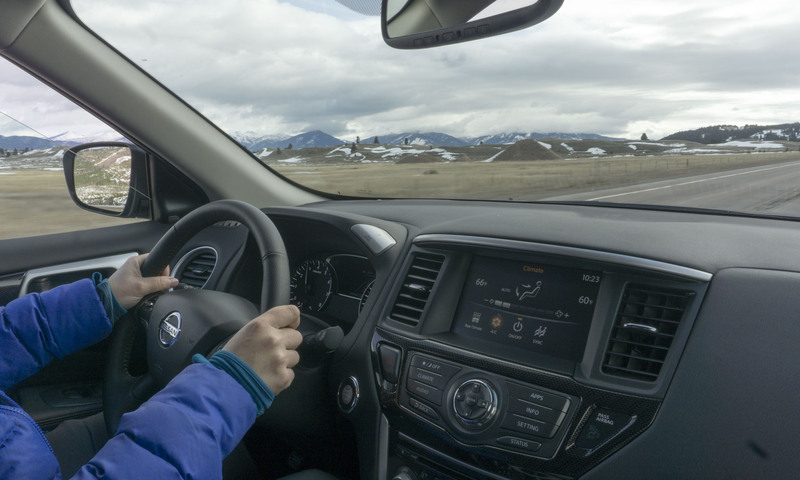 The ride is smooth and quiet even with the large wheels and tires, and this cool crossover feels comfortable cruising at 80 mph on freeways through central Montana. 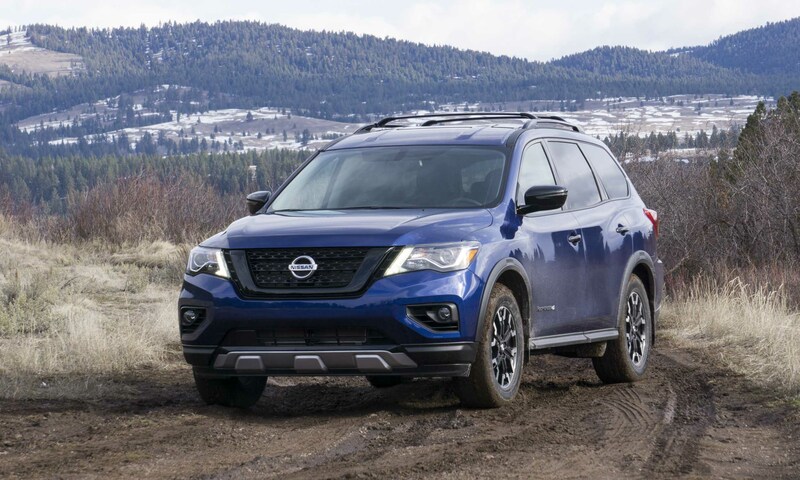 Although there are no major functional updates to the highly capable Nissan Pathfinder, the Rock Creek Edition adds a nice level of stylish features at a good value. 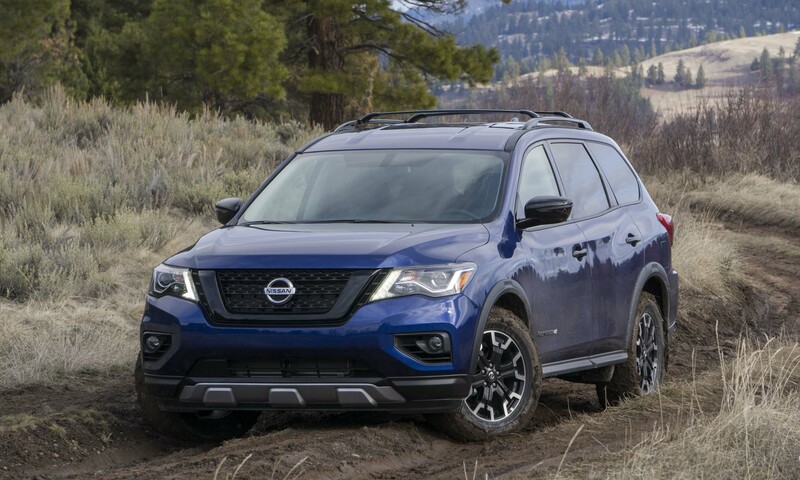 Whether running errands around town or taking the family on a road trip into the country, the Pathfinder Rock Creek Edition is certainly up to the task. 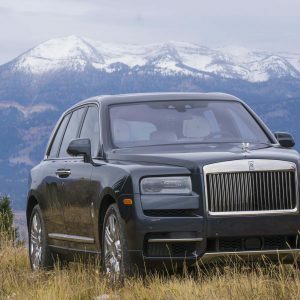 It definitely felt at home in the wilds of Montana.